In the 13th chapter of the Gospel according to John, we come face to face one of the most remarkable teaching of Christ, may God's profound peace and blessings be with him and may our station be elevated to the proximity of his blessed station. The teaching that comes through him was not in mere verbatim, but in the form of example of doing and living it, worthy of a perfect teacher of humanity. Here is the scenario: It was a significant and blessed time in Jewish calendar, the evening before the Passover Feast. The evening meal was being served already. In the heart of Christ it was inspired by the Most High that the time is arriving soon for him to leave this world. He had come from God and was returning to God; 'inna ni'Llahi wa inna ilaihi raji'un', Indeed we are from Him and to Him is the final Home-Coming - as reminds the Quran. In that evening pregnant with divine inspiration, Jesus got up from the meal, took off his outer garment, and wrapped a towel around his waist as a symbol to engage in an important work. It was indeed a profound action he engaged with that evening. What he did bewildered even his closest companions. He poured water into a basin and began to wash his disciples' feet, drying them with the very towel that was wrapped around him. The conversation he had when he came to Simon Peter gives us a glimpse of the mind of Christ at the moment. As he came to Simon Peter, Peter said, "Teacher, are you going to wash my feet?!" When he had finished washing their feet, he put on his clothes and returned to his place. "Do you understand what I have done for you?" he asked them. "You call me 'Teacher' and 'Master,' and rightly so, for that is what I am. Now that I, your Master and Teacher, have washed your feet, you also should wash one another's feet. I have set you an example that you should do as I have done for you. I tell you the truth, no servant is greater than his master, nor is a messenger greater than the one who sent him. Now that you know these things, you will be blessed if you do them." this particular chapter of the gospel and the action of Christ is a perfect example where esoteric, inner realization is beautifully and harmoniously manifested in exoteric practice, outer action. the human heart of christ without doubt was the chalice that held unparalleled love for his Lord as well as for his Lord's creation. Sufi teacher Said al-Jamal al-shadhili says in his teaching, Jesus Christ is Jesus Christ because he gave everything he had for God. his love was the highest form of love any human can ever long for and can ever give. in his highest gnosis Jesus had his veils of heart removed to see the creation as the manifestation of God's face. to love God's creation is loving God. the creation is nothing but infinitely manifestated face of The One. The Quran says, "Wheresoever you turn you see the Face of Allah." what is the implication of seeing the Face of the One in every direction, in all of creation? - is to serve the creation. that's exactly what Christ was demonstrating that evening. imagine the scenario again. this is someone who's heart is already made known that he will be leaving this world soon. instead of his being turning away from the world, he did exactly the opposite. 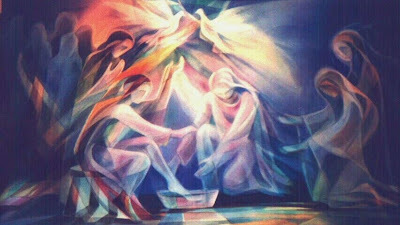 he turned his whole being to the creation by washing the feet of his disciples. the highest englightend being of the time serves the non-enlightened ones with a seemingly very insignificant action. yet in the spiritual world, any small action can have cosmic implication. 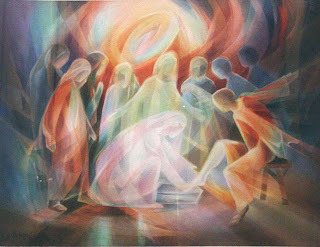 the washing of disciples' feet was such a paradoxical action that at the same time looks insignificant from worldly point of view, yet spiritually an action of cosmic significance. this is the work of a bodhisattva, this is the work of God realized ones and the perfect masters. since the veil of their heart is removed, they see perfectly how serving every creature is serving the Lord. when asked who is the best of mankind, Prophet Muhammad, upon him be peace, said: 'the one who's action benefits humanity, the one who serves other is the best among you'. the action of Christ was speaking from the same truth and same light. 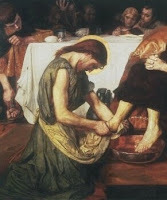 when Simon Peter protested as a disciple that his feet be washed by his teacher, the intense answer came from Christ: "Unless I wash you, you have no part with me." although Christ knew that the highest truth of his action will not be realized by the 'yet unenlightened' mind of his disciples, but it was necessary for him to perform it and to leave example for the world. when christ consciousness enters the heart of a human being then it approach to become 'insan kamil', the perfected human being and begin to see and manifest the action of loving the creation for the sake of loving the Creator. "Now that I, your Master and Teacher, have washed your feet, you also should wash one another's feet. I have set you an example that you should do as I have done for you. I tell you the truth, no servant is greater than his master, nor is a messenger greater than the one who sent him." the washing of the feet doesn't make Christ lower or the disciples higher. the messenger of God is a messenger, God alone is God. the practical implication is made clear in this teaching when christ says, "Now that I, your Master and Teacher, have washed your feet, you also should wash one another's feet." in the next post i would like to publish about a project, 'Gladdening the Sacred Hearts' which is in the spirit and intention of what is mentioned in the post. it is about a project that reflects a way 'to wash the feet of others' on a practical level in this world, specially for those who are less fortunate. i dearly hope and pray that you will come forward in your support and active involvement. peace be with you all.